Check out the new listing at 9518 E Jadecrest. Are you looking for Arizona active adult real estate? This home located at 9518 E Jadecrest Dr in Sun Lakes, Arizona has just been listed for sale. Located in the gated community of Oakwood Country Club, his home is move in ready and features many nice upgrades. This home has 2,151 square feet with three bedrooms and two and one-half baths. You will notice great curb appeal the moment you see the home with stone facade accent and mature desert landscaping. And, you have a double car plus golf cart garage. Large tile flooring and neutral carpet cover the floors and the decorative paint is stunning. Enjoy beautiful views from the large picture windows and sliding doors in the dining and living rooms. The kitchen is open to a family room with sliders that lead to the covered private patio. And you will fall in love with the remodeled kitchen featuring granite counters, under mount granite composite sink, new faucets, electric cooktop and stainless appliances. Entertaining is easy with the wet bar, granite counters and sink. Both bathrooms have been remodeled with beautiful granite and tiled shower and tub. When you buy 9518 Jadecrest in Sun Lakes AZ, you are buying an Arizona active adult lifestyle. 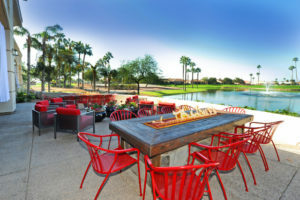 Sun Lakes offers plenty of resort amenities including golf, tennis, pickle ball, fitness center, fitness classes, senior softball, walking paths, lakes and restaurants. You can also enjoy the new Sun Lakes Oakwood renovated bar and restaurant named Stone and Barrel. Take family and guests to the Stone and Barrel for a specialty wood fired pizza, delicious burger or some of the more upscale culinary delights featuring chicken, salmon and steak. You can find free entertainment in the bar on the weekends or take in a Tribute Series concert scheduled throughout the spring months. It’s easy to get to know neighbors and share a lifestyle with people who have similar interests. Ready to learn more about 9518 E Jadecrest Dr? Learn more about Arizona active adult real estate in this video below, and contact us here or call 480-440-0849 for more information.